These are the kinds of things I think about pretty much all day long. Oh, and I agree with the commenter who said that Dr. Strange’s Sanctorum is clearly an illusion. Looking For Some Old Doctor Who and Star Wars Comic Books? Here are a few auctions I just put up on some 80’s Doctor Who and Star Wars comic books. All proceeds go to a good cause, namely my new MacBook fund. There are a couple of things I want to talk about without getting into a full-blown review. The first is the ESV Listener’s Bible read by Max McLean and the second is Astonishing X-Men written by Joss Whedon. 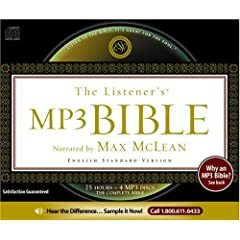 I’ve tried listening to audio versions of the Bible many times. Sometimes the reader is bad, sometimes the version isn’t suited for audio (in my opinion the Message fits into this category), and most often the production is just outright bad (almost every King James version). The Listener’s Bible is the exact opposite. The reader is good (if somewhat overdramatic in Gen. 1-2), the ESV sounds great read aloud, and the production is excellent. I got it free from Audible because of the Twit promotion, so I don’t know how much it actually costs, but it’s worth it. Moving on to something completely unrelated: Astonishing X-Men. I know that I am way behind the curve on this, but I just started reading the graphic novels this week and I love it. Whedon brings his unique dialogue to comics, something the industry sorely needed. Anyway, check it out if you haven’t and you are into comics. Comic books are increasingly rising in popularity in film and TV; Spider-man 3 broke all sorts of box office records, Heroes is one of the highest rated shows on TV, and Batman is cool again. While many see this as a trend that is bound to fail soon, I see this as a great opportunity to get more comic books on TV. So, here is my list of five comics that should be made into shows. Sandman by Neil Gaiman. This would be a bit odd and very dark, but it’s one of the best written comic books ever. The Swamp Thing by Alan Moore. Forget the cheesy 90’s TV show, Moore’s Swamp Thing was dark and scary. Plus, Superman shows up in some very surreal scenes. Rising Stars by J. Michael Straczynski. It probably wouldn’t work now because the story is similar to Heroes, but Rising Stars is a great comic series. It centers around a group of people who have been given super powers and the search for a super hero serial killer. (Again, Heroes totally ripped off this premise.) Plus, it was written by the guy who gave us Babylon 5. Preacher by Garth Ennis. This would definitely never make it to mainstream TV, but could work as an HBO show. The story centers on an ex-preacher who gets fed up with God and goes on a mission with his killer girlfriend and vampire friend to give Him a piece of his mind. It really is a good story. Stray Bullets by David Lapham. This book (volume 1) almost defies explanation, but I’ll try. There are three friends who are on the run from drug dealers after stealing a load of cocaine. They hide out in a city called Seaside that is actually 100 miles from the coast; it was developed by an odd guy who was obsessed with earthquakes. The story only get weirder from there. Well, there’s my list (although, no doubt I’m missing many). Anyone want to add anything? Edit: Much to my chagrin, HBO read my post, went back in time, and started production on a Preacher mini-series. The New Testament and the People of God by N.T. Wright. I’ve read a number of Wright’s books, as well as listened to a lot of lectures, but I haven’t read his most important works. I’m going to start digging in soon. Free of Charge: Giving and Forgiving in a Culture Stripped of Grace by Miroslav Volf. I actually was supposed to get this from Book Mooch, but the guy never sent it. Volf might be considered a liberal theologian at an apostate institution, but his work is great and from what I’ve read of this book, it will be well worth it. J.R.R. Tolkien’s Sanctifying Myth: Understanding Middle-Earth by Bradley Birzer. I heard about this book while listening to lectures by Joseph Pearce. I will gladly read any book about Tolkien or Middle-Earth, but especially if it’s by a guy who teaches at Hillsdale. The Sandman by Neil Gaiman. Okay, this has nothing to do with Christianity, but they’re still great. I probably won’t buy the collected trades, but I’m definitely going to read them. Through New Eyes by James Jordan. A few years old, but the ideas are something I need to learn more about. Mother Kirk: Essays and Foray into Practical Ecclesiology by Douglas Wilson. The Federal Vision by Steve Wilkins. I think it might be time I try to figure this thing out, or at least get a small grasp of the issue. Harry Potter and the Deathly Hallows by J.K. Rowling. Assuming, of course, it will come out this year.